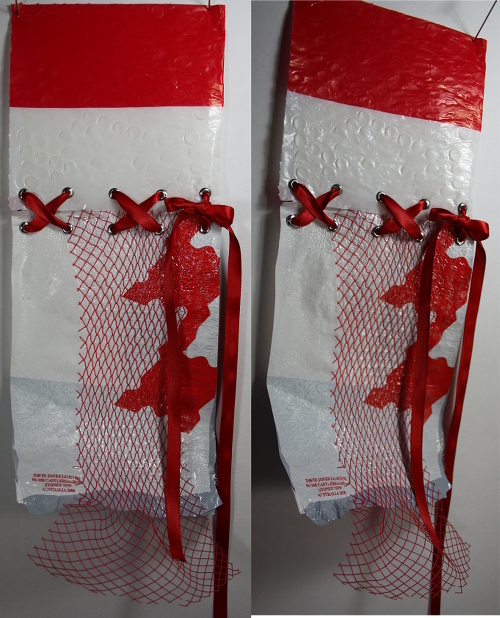 I wanted to try some variations of brushing on composimold, and started on a large scale bubblewrap. 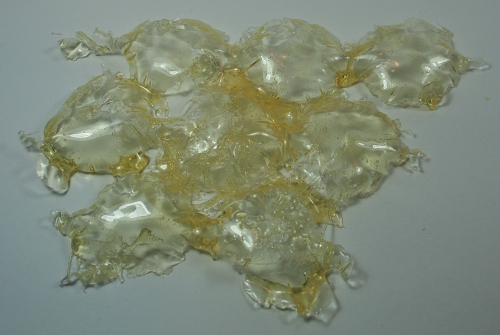 This was the wrapping material used in sample p2-65 (22-July-2015), where the larger size bubbles contributed to an interesting effect of indeterminate edges. A slightly less structured, more lively version could be useful. This piece is 16cm at its widest. The material is spread thinly across the top of the bubbles, but collected in the valleys. It’s quite strong and more floppy than flexible. Light is brightly reflected in the bubbles. There is texture and interest at the detail level from the tendrils formed by the cooling material during brushing. It is quite transparent in places. 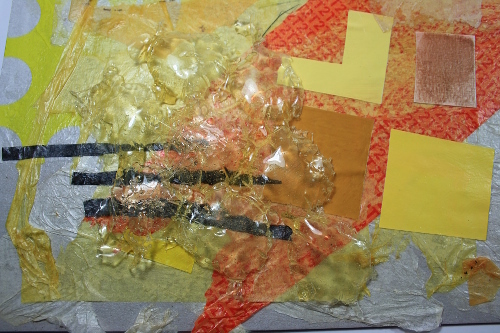 I tried the sample in a number of places on the collage based on sample p3-9 (4-September-2015). It caused a little distortion of the underlying elements, enriched the colour and brought in texture and a lot of light. This shows a lot of promise for future use, with some research needed on means of attachment. Following the previous sample, I wondered about added composimold to a collage directly. It would be a kind of glossy glaze, and a way of adding extra texture. I poured some composimold on the collage, then gently placed a few printer and computer bits on top. The photo above shows the texture, colour, depth and gloss created. It was attached, but just a little picking at it separated composimold from base. I don’t know if that would happen in real use if left alone. It did give me a lovely thin piece of texture which could be curled around into different shapes, catching light and making lovely coloured shadows. The curve brings out the molding that was achieved. This material continues to intrigue. Could anyone tell what the above is if they didn’t already know? I was thinking of sample p2-70 (22-July-2015 and many posts since). Could composimold be another way of creating a scarred shadow, an imperfect memory? I deliberately brushed the composimold thinly, unevenly, looking for fragility, translucency, scarring. The result has no structural integrity and collapses on itself like the shed skin of a snake. A strong simile and possibilities for metaphor, but I don’t know if there are enough clues left to trigger a response in the viewer. The handle might save it. The second set of photos above show various attempts to stabilize the work. A glass gave support but was too distinct. When upside down gravity clarifies the shape – that could be useful somewhere, but an upside down mug doesn’t make much sense. I made a spiral of plastic using the 3D pen, but it is intrusive and clumsy. A strip of acetate curled around inside was the most successful, but I’m not confident it would be stable over time. Modifying the original application technique holds promise – composimold a little hotter, more layers building up texture and strength. The two samples seen together don’t quite work. The pairing doesn’t add anything new. They look like alternatives rather than converging paths. This sample is a development of sample p3-10 (26-August-2015) and refers back to the exciting lines of sample p2-6 (11-June-2015). P2-6 had an abundance of lively lines which edged on overwhelming. 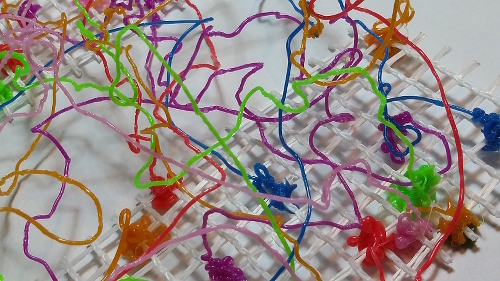 In this new sample a wriggling line using the 3D pen brings movement and energy to a static piece. The line works at a larger scale and brings the viewer closer to see the detail, thus allowing other detail in the original sample to be appreciated. On a technical note, the heat of the plastic being extruded from the pen slightly melts the composimold. With a little care the plastic becomes embedded in the surface with a strong join. 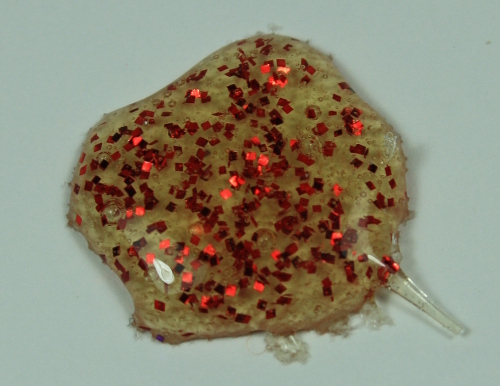 The plastic brings extra dimensionality to the sample, standing away from the surface. This is a successful combination of materials. It takes advantage of the different properties of the materials when joining them. The opaque line of plastic complements the translucent field of composimold. It is another way of adding texture to the texture of the mold. Perhaps it would provide another means of stabilising p3-25 – “decoration” that provides structural support. These samples refer back to sample p1-140 (21-May-2015). 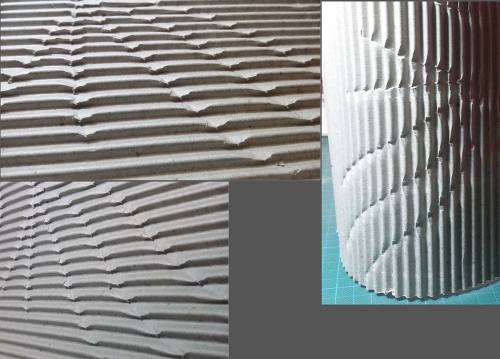 Using my molding materials, could I create a corrugated surface and then distort it to create a pattern? 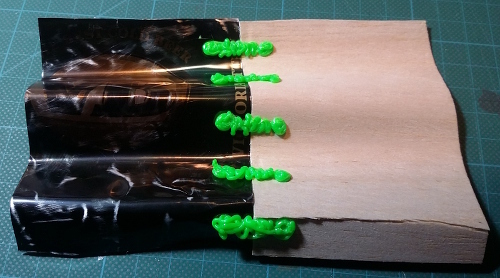 I experimented with my two molding materials in parallel, first molding on corrugated cardboard. Molding the polymorph went without a hitch. A quick, small test piece suggested no problems demolding, and indeed the cooled polymorph popped off the cardboard easily. I pressed the warmed sheet of material into the cardboard using a spiral metal skewer, and the traces of that add a tiny extra light-catching level of detail. The composimold did not go so easily. An initial test suggested it would stick to the cardboard. A second test with vaseline brushed on to the cardboard as a release worked satisfactorily. The full scale mold used cardboard thoroughly brushed with vaseline as the base and a sealing border of plasticine. Cardboard and composimold gripped tightly and would not release. The composimold was hotter and poured in rather than brushed on as in the test, which may have been the difference. Wetting the cardboard to assist rubbing it off revealed that composimold gets slimy and then tacky when moistened. With time and determination almost all the cardboard was removed, but it raises questions over the behaviour of composimold in humid as well as hot conditions. Having molded the corrugations, the next step was to distort them in a semi-controlled way. The first attempt of heating a palette knife in boiling water and pulling it across the surfaces had no effect. In the following series I used various tips on a wood-burning tool. Tip “a” had a wide base that was easy to drag across the polymorph. The tool has no adjustable heat regulator and it was a matter of judgement on speed to melt the material enough to shape it while still being able to glide the tip and not stick or cause holes. The effect is subtle and depends on lighting, but reasonably effective. The tool tended to burn rather than melt the composimold, but an interesting watery ripple effect was created. It is even more subtle and dependent on lighting than the polymorph. Tip “b” had a more slicing than sliding effect and tended to skip across the surface in little jerks. The results are not controlled but not really random. I don’t find the texture created inspiring. The tip was more effective on the composimold, but the photograph shows it in just the right light. From most angles little can be seen. Tip “c” is round and flat, intended for transferring designs on to wood. I both dragged it across the surface and used it like a branding iron. Both methods worked fairly well on the polymorph, although I held the tip a little too long when “branding” and the polymorph melted and pulled up with the tip. This results in a few holes, but also one of the more effective and visible marks. A series or pattern of dots across a surface has potential. The broader ripples caused by dragging tip “c” across the composimold make it one of the most effective on this material. It works to break up the rigidity of the lines of corrugation into a more organic form. It would be interesting to combine this with earlier ideas of adding colour to the material and collaging it, for example to bring light, depth and texture to a water theme. The brand effect was not effective, as the tool was too hot to leave touching the material. Tip “d” was intended as a brand, a series of parallel lines in a dot. It worked well on the polymorph, although dragging it across was difficult. I angled the branded lines across the lines of corrugation and the change in scale and orientation is effective. This was also one of the more effective tips on the composimold, making small dots that are visible on both sides of the material. The small branded lines are just enough to catch the light differently and the overall surface is smooth and more glossy than the slightly degraded surface left by removal of cardboard. The final tip was used both to score lines across the material and to pierce holes. Both were very effective on the polymorph, and this would provide a much more controllable and effective tool for creating holes and channels than the soldering iron used in sample p3-13 c (1-September-2015). I would like to use this on a flat sheet of the polymorph to see if more fluid drawing lines could be created. The tip was also very effective in creating lines across the polymorph. When handling and twisting the material it makes bending across the line of the corrugation easier, with the bonus of different reflections as the gap opens. The line created is clearer to follow than the broader ripples created by other tips. Hole creation was less effective, with gaps refilling and the concern that holes too close would merge. Overall the wood-burning tool has potential in embellishing molded surfaces but the impact of results are very dependent on lighting. Side lighting is more effective on the broader distortions such as from tip c on the polymorph. The distortions are visible from both sides of the composimold. As sampled here the results on both materials are subtle. A more effective use could be a single type of mark used in a pattern over a wider area. The pattern could be easier to discern, especially if the angle of lighting reflected well on only part of the work. The two previous samples, complete with holes punched down one side, provided the opportunity for more exploration of joining the two molding materials. Sample p2-3 (6-June-2015) was a reference for the lacing style attempted. A number of threads attempted proved too bulky to fit through the holes already punched, however 28 gauge wire slipped through the polymorph holes easily. It was also easy to force through the composimold in areas where there wasn’t already a hole. However the wire looks spindly and inadequate, quite out of proportion with the more substantial materials being joined. Spiral decoration added at the bottom in lieu of a bow suggested an alternative treatment. The same wire was laced through, this time with a spiral being formed in the wire each time it comes to the upper surface. This provides more visual weight and interest, at the expense of making the join less effective. It doesn’t contribute a positive to the composition. Stranded cotton embroidery thread has more substance and presence. The thread compacts well in the holes, but naturally spreads on the surface and creates greater impact. I used a chenille needle which was effective in getting the thread through the holes and in creating holes as needed in the composimold. However I did notice the thread getting a bit sticky as it was passed repeatedly through the material – perhaps it was a gradual build up of heat from the hands, or friction from the thread movement. The clearly different nature of the thread brings variety and interest, creating an effective join both decoratively and functionally. This is clearly the most successful of the three lacing samples. An attraction in the previous sample was the visibility of the thread through the composimold. I decided to explore this further, embellishing with simple stitch. This refers back to project 5 of part one, puncturing and stitching, which I didn’t attempt at that time. I followed a few of the lines created in sample p3-28 with a running stitch. The strands of the embroidery cotton lie smoothly side by side as the thread passes over the corrugations. When going underneath the surface the colour is muted, the sheen vanishes, and the line is slightly distorted. I decided to use a simple knot at the end of each line of stitching. This gives a consistency of appearance from the surface. Given visibility is unavoidable I found this an attractive alternative. I like the slightly wayward character of the short loose ends given the strong lines elsewhere. The ease of stitching into the composimold and the clearly different yet compatible appearances of materials makes this an attractive form of embellishment. Given the subtlety of the wood-burner marks only a few lines of stitch were added. Any more would dominate too much. With this I find my eye more willing to search the “empty” areas for more information. 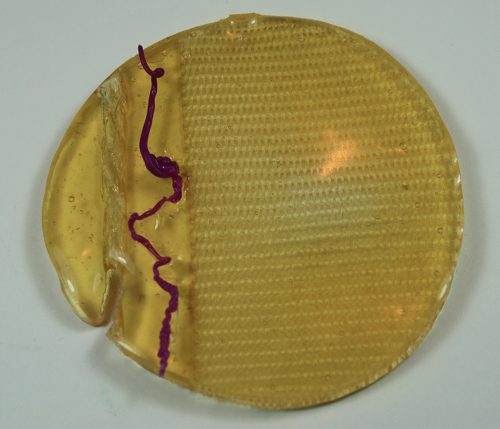 Highlighting areas of wood-burner marks using stitch was also effective on the polymorph sample. The sheet of material is fairly thin and there was no difficulty pre-punching stitching holes with an awl. Given the opacity of the material I chose to carry threads across the back more than in the previous sample. On review I think this was a mistake in the top right quadrant, where the thread moving from one group of stitches to the next can be seen from the surface. The row of holes up the side was visually dominant and cried out to be stitched, although the rather bulky and loose french knot used as part of maintaining the angle of stitches at the side calls for refinement. Although the burner marks on this sample are more apparent on this sample I still restricted the areas of stitch to maintain balance. I view both stitch samples as successful and holding potential for further development. As previously discussed (29-August-2015) I decided to explore further with composimold and polymorph, rather than go on to other materials. This linked back nicely to the joining exercises of Assignment 2. In particular I was thinking of sample p2-5 (7-June-2015). The was a join of two very different materials where I was able to take advantage of the properties of one to shape the other. In turn that sample linked back to the accordion folds of Assignment 1, which is satisfying. /content/making-polymorph-sheets-and-brackets). Effective and I got fewer air bubbles, but if you try it be very careful of the heat. 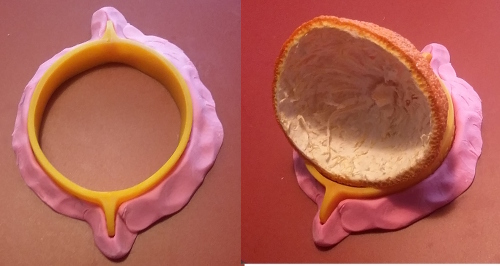 When the polymorph had cooled I put on the silicone ring and sealed with plasticine, then poured in composimold. As the image shows there was a small area of overlap, and I anticipated that there would be a little seepage at the edge underneath. 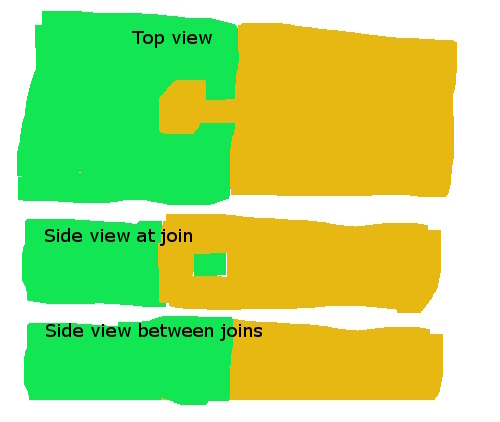 Would the materials bond sufficiently for the join to hold? 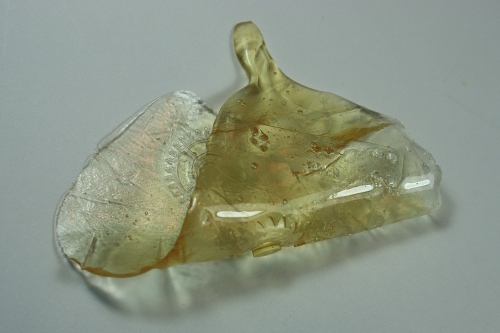 I thought the composimold would be sufficiently hot to melt the polymorph slightly at the edges, but I didn’t see any change of colour from white to transparent so apparently not. When set I was able to demold the pieces together. While setting I’d realised my best sides might not match, given earlier composimold samples looked clearer with the molded side down, but the polymorph needed to be viewed molded side up. On this sample the patterning on the composimold was larger, more distinct and regular, viewing well from either side. The two materials complement each other and create an attractive whole. Unfortunately the materials hadn’t bonded at all and just peeled apart. While not my current focus, I like this effect. There’s a sun and moon, yin and yang feel. It appeals to my interest in boundaries and fragility. It also provides the opportunity to play with negative space, or to create tension or connection across a wider space. The next idea was to create create holes with channels leading to them in the polymorph. When adding the composimold it would run through the channels underneath, up through the holes, then link into more material spreading across the top. 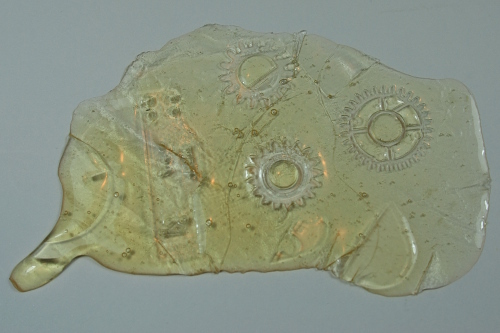 I flattened out a piece of polymorph, then made a series of attempts to create the holes and channels. An initial try with a fork didn’t create satisfactory holes and the channels were minimal. I then tried pushing wires through a flat piece of polymorph. The wires would stay in place while the polymorph was pressed into the mold, thus creating channels. Another dead end. I didn’t have enough hands to control all the pieces and any holes or channels disappeared as I molded the polymorph onto the card. Perhaps I could take the polymorph mold, remove it to creates holes and channels, then replace it on the mold ready for the composimold. I used a different computer card this time, spikier, with the thought it would help me replace the plastic more accurately. 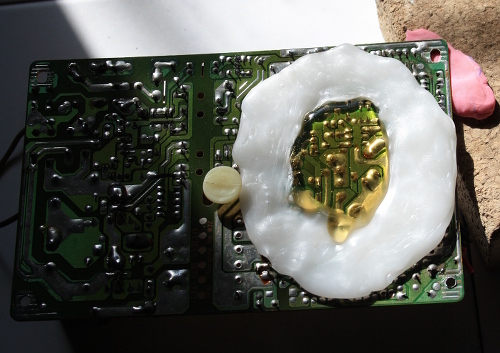 The mold took quite well and I was able to remove it with a bit of a struggle, but it was immediately obvious that I wouldn’t be able to get it back on. On to the next idea. 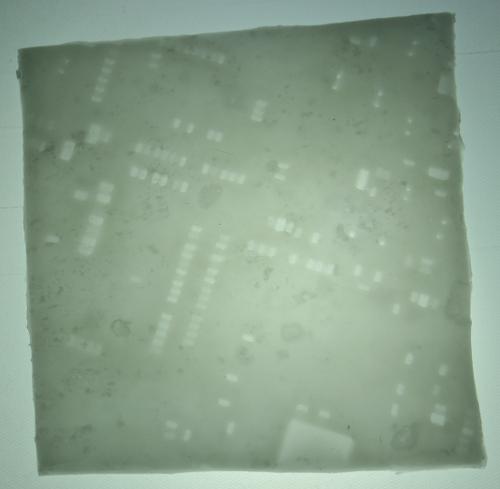 I made a flat piece of polymorph and made holes and channels using a soldering iron. One of the things I like best about this attempt is the shadow in the photo – mysterious soldering iron on its stand and lively wisps of polymorph at the edges. I reheated the result in the microwave. The thickness of the piece was uneven – I had to stop heating before the whole piece was soft, or risk everything collapsing in a sticky mess. As a result the molding onto the card wasn’t complete. Meanwhile the seal at the edges looked too complete. I had tried to avoid pressing down too much at the edges, but it was all rather difficult to manage. I continued regardless, adding the ring and sealing. I deliberately poured the compositor a bit thick and over the edges into the holes, trying to encourage the formation of connections. The result is promising. 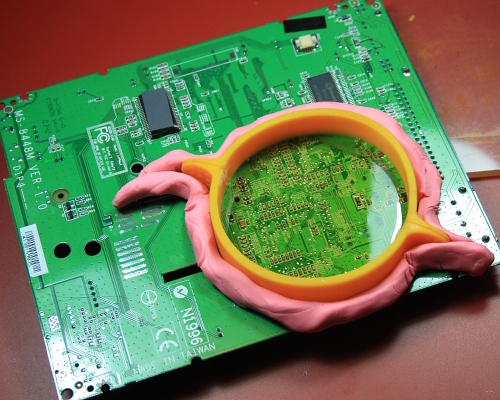 There are a few flaws – some rusty marks from the soldering iron, a tiny piece that adhered from the mold (I was able to remove it later), distinctly non-circular. Still the connection is quite firm, the composimold managed to get around all the edges creating a neat finish, the molded impression carries across the two materials successfully. I was pleased with the outcome but wanted to take it further, creating movement in the composimold by distorting the polymorph. First I tried heating with hairdryer, hoping to soften polymorph enough to twist it. The composimold started getting tacky, with no sign of the polymorph reacting. Next I tried steam, trying direct it at the polymorph only while protecting the composimold. The composimold started getting tacky. Time to move on, but not before another photo. This is definitely a sample with potential. Even the channels and holes could be arranged to decorative effect. The next sample was basically the reverse. I made a ring of polymorph, fairly thin and stretched even thinner around the centre hole. Molded into the computer card it made a sealed area to contain the composimold. This photo shows both materials on the card, plus the delicate propping up required to provide a close to horizontal surface. This result also shows potential. The more spiky surface of the card produced strong marking on both materials. It looks like some sort of code – computer hieroglyphics. The combination of materials continues to please me. There is a gloss to the composimold, a sheen to the polymorph, which provide variety with an overall unity. The thinner polymorph and extra depth of molded holes gives an increased translucency in the backlit view. The join is reasonably effective, but I suspect with a little effort I could push the “window” out. 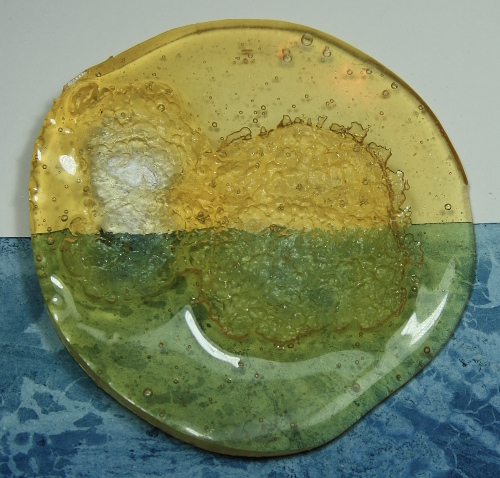 In this particular sample there is also an unfortunate resemblance to a fried egg – by amusing chance I used the silicone ring to angle the work to catch the light better in one photo. Once again I wasn’t able to deform the polymorph. Any heating affected the composimold first. Reviewing the work now I wonder if I could pop out the window, distort the polymorph, and reinsert. I’ll attempt that in my next work session. Wanting to reflect before continuing the previous sequence, I turned to joining polymorph and textile. 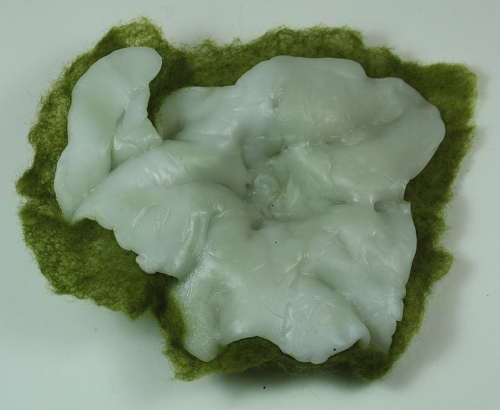 Sample p3-7 (23-August-2015) was an unsatisfactory attempt to use a textile as a mold for polymorph. This time I wanted to try joining a textile and polymorph in the molding process. I used a piece of thin commercial needled prefelt for the textile. I had a vague idea that it would have lots of short fibres that could be partially removed. 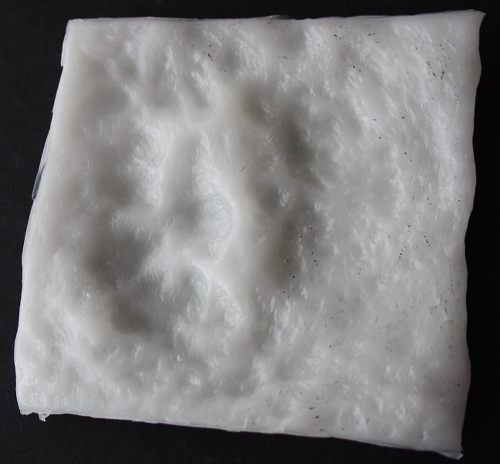 A flat piece of soft polymorph was place on a flat surface and the prefelt laid over. I then pressed down with a computer casing part. You may just be able to discern some molding of the materials in the photograph above. It is obvious to the touch, but the texture and depth of the prefelt almost entirely obscures the impression of the mold. I tried pulling off areas of prefelt. It became slightly thinner, but all those short fibres were too deeply caught in the polymorph. 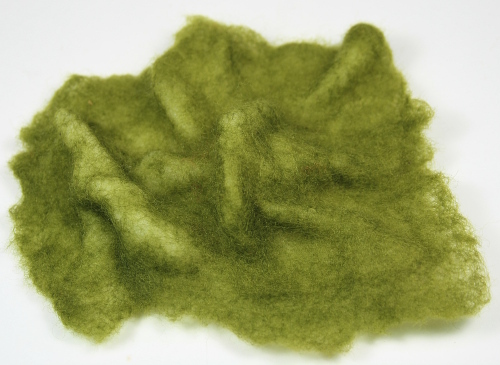 I then tried to mat the prefelt, using water and rubbing – basically felting it. Perhaps because I had already removed a lot of fibre there was no significant improvement. It just looks a fuzzy mess, and any photograph just looks an out of focus mess. Deeper molding was needed. 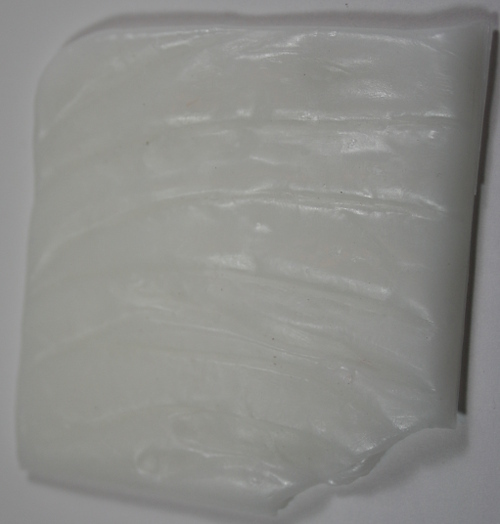 This time I made a sheet of polymorph, then pressed prefelt into it and molded the joined materials by hand. When cooled I used soap, cool water (no heat, which would resoften the polymorph) and gentle rubbing to consolidate the prefelt. Scale is difficult to see, but the top “peak” is almost 3 cm high. The polymorph and prefelt are solidly attached. It feels quite light – 21g on my kitchen scales, 12 x 9 x 3 cm. There is so, so much potential here. Remember I can colour the polymorph (sidetrack in assignment 1, 21-April-2015). On smallish pieces I could use a larger sheet of prefelt and incorporate it into a larger felt piece. I could have more control of the final shape by making a mold in kinetic sand (another sidetrack, 16-April-2015). I could make holes with a soldering iron (see above, this post), or perhaps finer and neater with a hot T-pin say, and attach to whatever by stitch. I need to experiment, but can’t see why it wouldn’t work with fabrics, at least thin ones. Or I could attempt a thinner sheet of polymorph, even lighter. If I want 3D in textiles and it doesn’t need to be soft or pliable, I have the technique. I’m giddy with power. To finish this session I did a quick series of experiments with composimold, some only 2 cm across. As a base, thinking to add some texture (that is the focus of this project!) I used a sanding sheet. Unfortunately some of the white surface adhered to the following and clouds the results. Although small and quick, I think the results are significant enough to dignify them with individual sample numbers. Glitter added to composimold. It’s suspended quite evenly through the depth of the small piece. 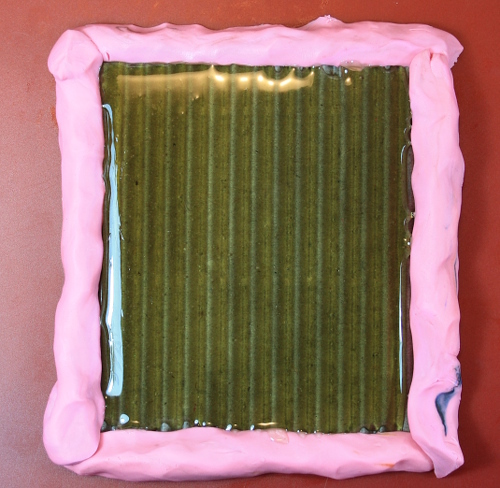 That could vary with how hot and runny the composimold was and also the size (and therefore cooling time) of the mold. I’d like to take this further with threads, perhaps break the surface. A small amount of acrylic ink added to composimold. 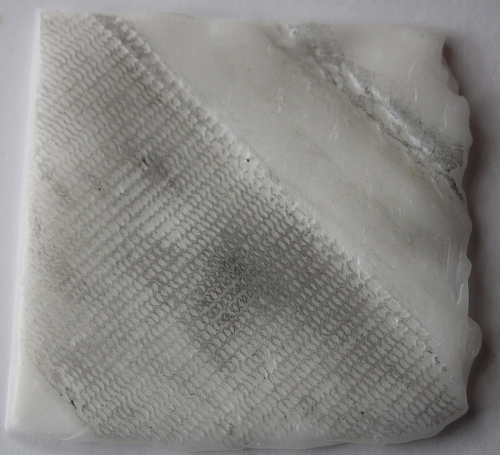 The reverse side shows the texture and flecks of white from the sandpaper surface used. There’s a slight cloudiness, which could be caused by the type of ink. The ink colour is called “indigo”, and there’s clearly an impact from the original colour of the composimold. In the right application even limited control over colour and transparency could be very useful, although for my main set of samples I like the simplicity and clarity of limited colour – the focus is kept on the patterning of the molding. 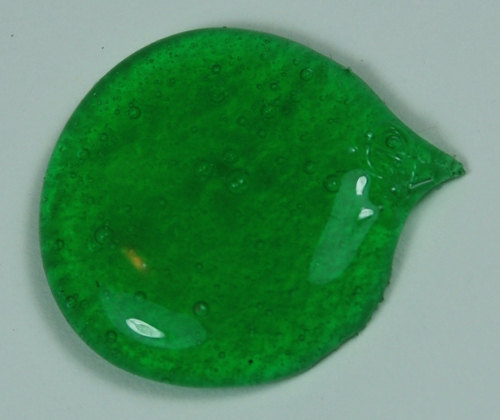 This sample used a transparent emerald green ink with the composimold. The colour is clearer, although still affected by the base. Other than the marginally improved clarity it doesn’t add anything additional to the previous sample, but it provides a base case for the next sample. The same ink as in sample p3-19 was used, but this time as drops on the surface of the cooling composimold. The first, central drop spread nicely on the surface but is smoothly integrated. The later drops have a strange surface tension rippling effect. The composimold would have been cooler and perhaps have reached its final shape when the drops were added, which could have caused the slight rippling. As always, potentially useful in the right application, although probably enormously difficult to predict and maybe unreliable over larger areas. Scraps of set, coloured composimold from mixing the last few samples were added to a new, warm pool. The scraps slightly melted in and have become an integral part of the whole. Getting back to molding and casting, the diamond shape on the left was from the palette knife used for mixing, so this could be a way of joining smaller molds into a larger piece. Probably just putting two pieces side by side and either applying a little heat or dribbling on some more composimold would work. There is a lightness to the 3D effect. This sample opens up all sorts of decorative possibilities. The final sample in this set has a lot of glitter added, thinking back to Patrick Delorey’s work (15-August-2015). 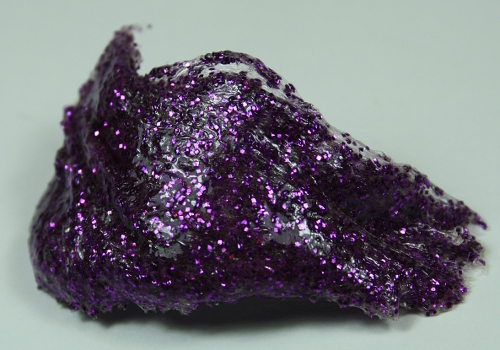 The composimold holds it well and I can rub the surface without lifting any glitter. Possibly it could hold more, but I would need to resoften the composimold. It cooled quickly with the additional material. Once set it retains its normal pliable properties. 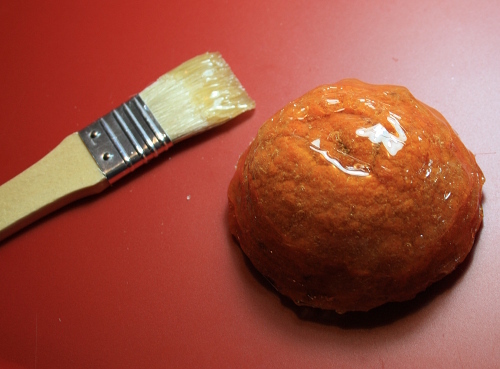 Although the curving shape is clear, the glitter disguises the detailed texture resulting from pressing the cooling mix into the neck of a sumo mandarin. A comparison to the glossy reverse side makes this clearer. This leads to the observation that I was able to use the composimold like a putty, pressing it into the surface of the mandarin. I don’t recall any problem with tackiness or fingerprints – is that because of focus, temperature or the additive? Perhaps a non-glittery additive would show the molding more clearly. I should try forming the polymorph and composimold separately, then using heat on the polymorph edge to melt the composimold around it. Make use of the lower temp of composimold. Set it in place first, maybe varying thickness or not across the full space, then push in warm polymorph. I still won’t get 3D movement, but it might be more integrated. I should go back to my earlier sketching inspired by Louise Nevelson’s work. This is both for the larger scale development of patterning, but also the thin cut foam I used for stamping. Can I create a mold using that? Thinking of a larger scale combination of molds and patterning, even if I don’t have time and materials to do it I could sketch or collage ideas. Could I then use the collage, take a mold of it? 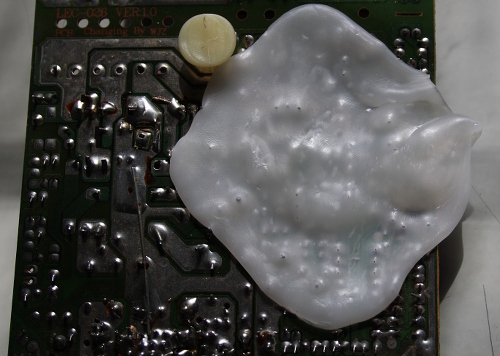 Similar to previous point, brush composimold on computer parts – create a “shadow” mold, referring back to the shrink-wrap shadow mug of sample p2-70 (22-July-2015). I’d say use the same mug, but I broke that and it’s still in its wrapping. My tutor mentioned Anthony Caro in her last feedback. I’m not familiar with his work but a quick look tells me I need to learn more. Relevant here because of building up shapes and patterning. I need to review samples from assignments 1 and 2, mine those for more possibilities. I have three (non-consecutive) days left in my schedule for this project. I note as a positive that my automatic response was that some reflection and sketching time is vital in developing and choosing the ideas to attempt. So day one will be that. After the session using composimold (26-August-2015) I felt the need to step back and think about next steps. Wanting to examine results so far more closely I worked on my photographs in gimp (GNU Image Manipulation Program). First I manipulated individual photos. I like the combination of the different materials, so I tried printing out photos (glossy), carefully tore them (Assignment 1) and then combined. The layers of photo paper separated as I tore, effectively widening the photos in one dimension. This meant they didn’t fit neatly overlapping when combined and my attempts to force the issue caused distortions. 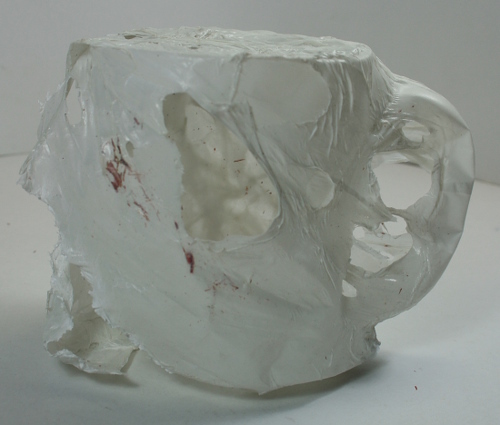 I want to carry forward the idea that a combination of materials can create tension and distortion. I’ve also spent quite a lot of time handling the samples themselves – looking at them, bending and stretching, layering them in different orders… Below are a couple of my favourite combinations. Sample p3-9, composimold impressed using a computer card, is the most effective as a top layer. There is enough patterning to create interest without obscuring the lower layer too much. I want to take composimold further, plus I want to use it in combination with polymorph. The two materials seem to have an affinity – they are both 1 part molding materials that soften with heat. Both can be reheated and reused multiple times. The honey and white, transparency and translucency work well together. On another student’s blog I read about El Anatsui – “He feels it is important to work with a newly discovered medium until you really understand it and can “get something intrinsic out of it”” (ninaoconnor.wordpress.com). I’d planned to move on to moulding with some silicone and some plaster that I purchased at the same time as the composimold. Instead I’ve decided to use the time to explore deeper rather than wider. It means I’ll work with few materials than suggested in the course notes, but I’m confident it’s the right choice. Post edited to add a detail of image d, which was based on an image of sample p3-11 (26-August-2015). Zooming in based on Lottie’s comment it looks like human skin under the microscope. With colour inverted it looks to me like fibres, a closeup of felt. That suggests development possibilities. Last week I got feedback from my tutor, Rebecca Fairley, on Assignment 2. In my own review (6-August-2015) I was pleased and excited about the work, and happily Rebecca was also very positive. She even asked my permission to put a write-up on the WeAreOCA blog, which you can see at http://weareoca.com/textiles/judy-nolan/. being brave and taking risks, not just in sample making but in the way I approach drawing. On the drawing side in particular I think I can learn/steal from some fellow OCA students who are doing exciting work in A Textiles Vocabulary, the other new level 1 textiles course. Examples include Charlotte/Lottie (thecuriosityoflottie.wordpress.com), and Julie (aslowunravelling.wordpress.com). One of the exercises involves sketching as a way of exploring archive textiles – not drawing to make a picture, but loose and inventive discovery. Drawing as a useful part of the way I work, not an end itself. building up, blending, linking – of technical understanding, knowledge, research… I now have a framework, a scaffolding. I love the feeling of broadening, strengthening, enriching that, making connections. Rebecca points out this will both inspire and inform my own creativity and making. review what I record about my own and others’ work. I need to do this more – sometimes I wonder if I have the same “new” insight or revelation over and over again. Plus I may understand more fully with a little distance and time. Rebecca recommended “continue to develop the language you use to discuss and reflect upon your own work and the research material you collect. Nothing is too wacky or too strange, record your thoughts honestly…” Similar advice was given in her feedback to Assignment 1, and although I experimented with language a little it was all rather stilted and awkward. I think editing out the wacky/strange part could be being afraid of appearing stupid or obvious or wrong. So what? I can develop, extend, change ideas later, but not if I’ve forgotten them. And as for sounding awkward, I suspect it’s that I don’t take my own work seriously. It’s just student work, it’s just a sample, it’s only a bit of fun. Being self-deprecating is a defence. To treat my work seriously, to write about it as an artist writing about her work, is to be vulnerable. I think that’s a new revelation (see point above). The work is playful, fun, exploratory samples by a student – but it’s still serious, and deserves to be treated as such. So going forward I’ll try to be less safe, less hedging my bets. And I’m going to try to be conscious of how other artists write about their work – not just the content, but the language – then note the bits that resonate with me and try to copy them. Composimold is a composite molding material. The details are a trade secret. It’s biodegradable, food safe (but don’t ingest), honey coloured, rubbery at room temperature and melts in the microwave. 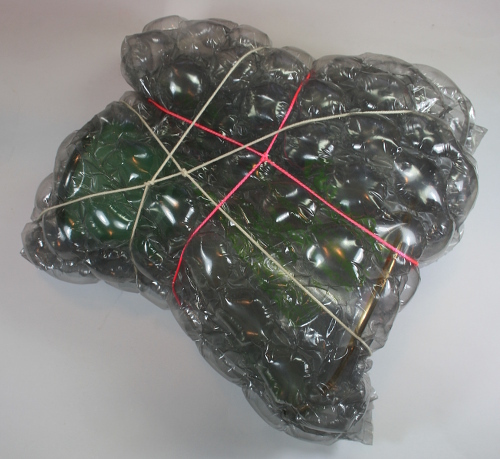 It’s designed for mold-making, and can be melted and reused at lest 35 times. I got mine from Aldax in Sydney (http://www.aldaxstore.com.au/), and there’s lots of information (except for composition) on the Composimold company website http://www.composimold.com/. In my first experiment I used a silicone egg ring on a smooth plastic cutting mat as a base. Plasticine was used to create a seal around the bottom. The tub of composimold was put into the microwave for three bursts of 30 seconds, until it melted to the consistency of runny honey. A pool was poured into the ring, then a half skin from a sumo mandarin put on top. No mold release was used. I waited for around an hour for the composimold to set (ambient temperature around 18° C). The backlit view gives the best idea of the level of detailed texture captured. Where the mandarin rested the material is thinner, but there are no breaks. The mold is delicate, ethereal. Variation of depth causes colour change, enhancing our perception of the textured surface. Tiny air bubbles bring vitality and light into the surrounding material. What would be a flaw in a mold for casting becomes a positive here. The photograph on the left demonstrates the flexibility of the material. The disc will fold right back on itself with no apparent damage. I feel this could be useful, although I don’t have a particular application in mind yet. This image also shows the “splash” effect of the molding material moving up around the mandarin skin as it was placed in the ring. The material is almost totally transparent. On the right a piece of indigo dyed paper has been placed behind it and detail of the patterning is clearly visible, green through the gold of the composimold. The surface of the composimold is very slightly tacky to the touch. The samples I saw in the store had picked up dust and lost their gloss and some of the transparency – something to consider when presenting and storing work if those properties are significant. A closeup of the splash effect shows the energy and dynamic interest created. The delicate tracery around the edges is moderately strong but I suspect would not withstand prolonged or rough handling. A final, full view of the sample. A very exciting result which left me keen to explore more. I have however noticed the pace of experimentation has slowed still further. I like to see the results of one sample before deciding on the next step, and setting time is becoming significant. I will probably need to adjust my process when working with the casting materials or I won’t be able to meet the assignment deadline. 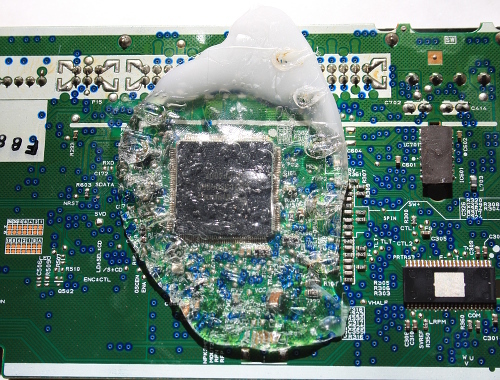 A computer circuit board was used as the source of texture in this sample. 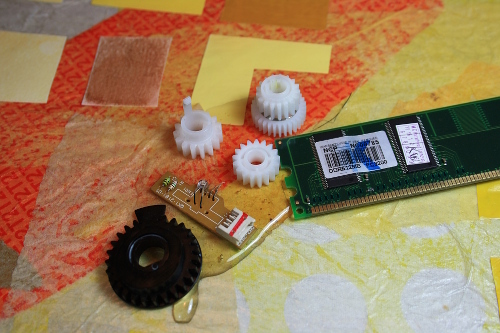 The same egg ring and plasticine were used, but this time the base was the circuit board itself, propped up to be roughly level. The composimold was able to capture the detailed connections on the card. There is interest and variety but also order in the impression obtained. The photograph to the left demonstrates the impact of different angles of viewing. The colour of the material is much richer where we are looking through the full width of the mold. 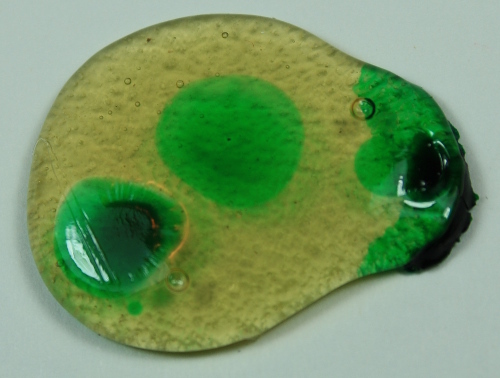 In sample p3-8 the best photographs had the molded surface showing and the smooth surface on the table. This allowed appreciation of the depth of texture. In the current sample the best photographs had the smooth surface uppermost. When the molded surface was on top visually confusing and blurring shadows muddied the image. Sample p3-10 was molded on a warp-faced synthetic luggage strap and a loose round braid of synthetic yarns. Egg ring and plasticine were used to contain the molding material, and once again I didn’t used a mold release or prepare or pre-treat the base materials in any way. 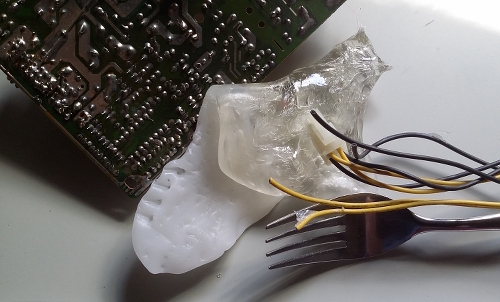 Some composimold adhered to the surface of the strap and it had to be very carefully peeled away. A small amount of material found its way underneath the strap, but it was a simple matter remove it. However the braid was basically encased in the composimold. I cut through one side and was able to extricate the braid, but it has created a thin and weak area across the mold. Despite or because of those difficulties, the fine details of the texture have been captured and the result is pleasing. The backlit view allows one to appreciate the intricate impression. This material is very effective in capturing texture. 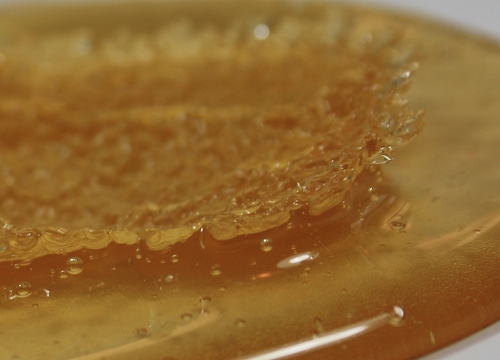 The transparent honey is pleasing to my eye. Being a one part material that is simply heated in the microwave makes it easy to use – and reuse. The major constraints are low tolerance to heat (of course – it melts!) and possibly picking up dust, degrading the appearance. I also find the combination of materials, polymorph and composimold, of great interest. Above we see the same three subjects captured in the two materials. I would like to find a way of joining these elements in a way that can take advantage of different lighting conditions. Looking again at sample p3-8 while writing up this log led me to make one final sample during this work session. The delicate splash effect on the earlier sample made me wonder about a full mold catching that dynamic lift. The composimold site shows the possibility of painting on the material, and this seemed a good fit to the task. This sample is a delightful, delicate bowl that beautifully records the mandarin’s texture and shape. The appropriate colouring is a lucky happenstance of the combination of materials. The flexibility of the material makes it a simple matter to turn the textured side out, in the photograph highlighting the glossy surface of the painted side. The backlit view visually flattens the bowl, creating a flower-like look. On this first experience I am very taken by the possibilities and ease of use of this material. I have a few days of other activities scheduled, which will give me some time to think about next steps. The goal in this project is to capture the texture of other materials using a casting material. 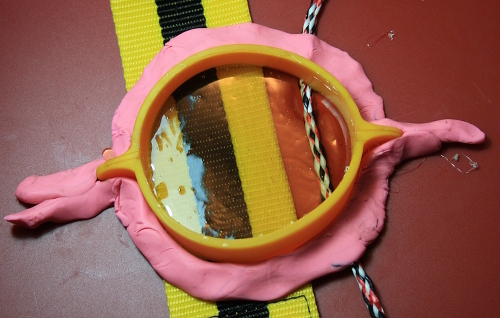 I chose to start with polymorph, a thermoplastic, having experimented with it on a sidetrack in Part 1 (21-April-2015). Immediately apparent was the challenge of photographing a shiny white textured surface. I tried multiple backgrounds, lightsources and angles, then chose the best result(s) for each sample leading to some inconsistency in this presentation. Clicking on the smaller images below will lead to a larger version. Polymorph rolled to 5mm sheet, then pressed into a cabbage leaf. A series of curved lines are indented in the surface. In this horizontal arrangement the curves are calm as they merge and spread to cross the space. One corner is broken off – I think of a shoreline or rocky outcrop by the sea. In some lights the uneven surface between the curves catches the light, just as the swell of the ocean glints in sunlight. 5mm sheet pressed into a sumo mandarin, the overall curve gently pressed flat while the plastic remained pliable. This is a highly textured piece. The patterning is very organic in nature and seems to shift as you look at it. A spiral is apparent, but shifts as I try to trace it and a new spiral suggests itself. Some higher areas appear smoothed – a true reflection of the fruit? A mishap in making the mold? The varied depth of the impression, inconsistent reflection and general complexity has proved beyond me as a photographer. A video looked sharp on the phone but blurred on a larger screen. Based on the first two samples I decided to use the polymorph thinner, looking for more pliability and clearer molding, plus better effects from backlighting. 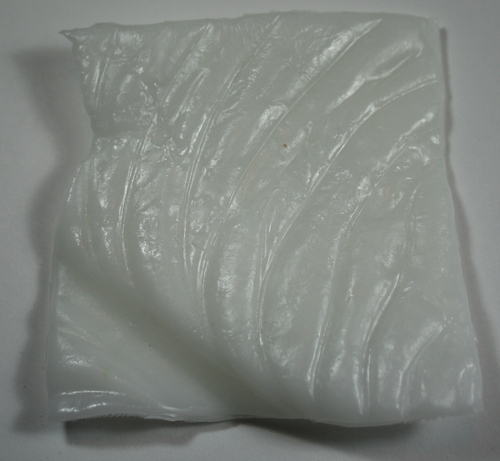 3mm polymorph sheet pressed into cabbage leaf. The extra pliability of the thinner sheet, plus my extra experience in pressing the polymorph into the form, has resulted in a much clearer mold. Lines are crisper and there is more detail in the surface between the ribs of the cabbage leaf. The inclusion of the main rib across one corner and the alignment of major elements on the diagonal creates a dynamic composition. 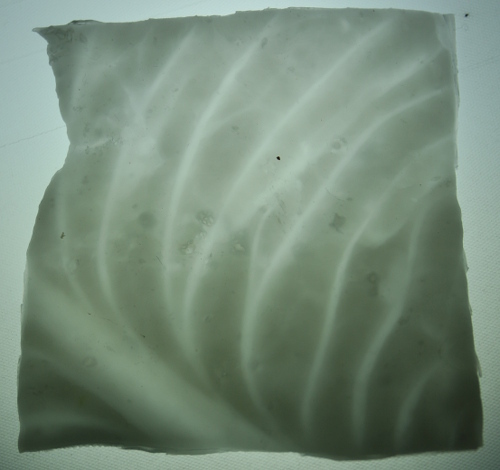 The overall shape of the sheet deformed with the shape of the leaf, and was not adjusted as in sample p3-2. This adds to the sense of movement and increases the response of the work to changes in the direction of lighting. The thinner sheet is more translucent, thus providing greater impact from backlighting. 3mm polymorph sheet pressed into sumo mandarin. 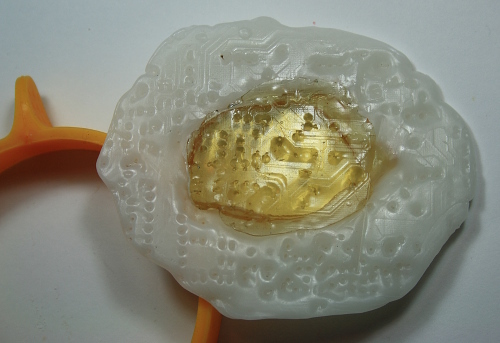 Similar improvements are seen in a repeat of the mandarin mold in thinner plastic. The small black dots visible are the remains of crayon rubbed across the surface in an unsuccessful attempt to further highlight the texture created. The complex surface is still difficult to decipher. There is a sense of a spiral, but still a lot of visual noise. Attempts to photograph a backlit view were not successful. 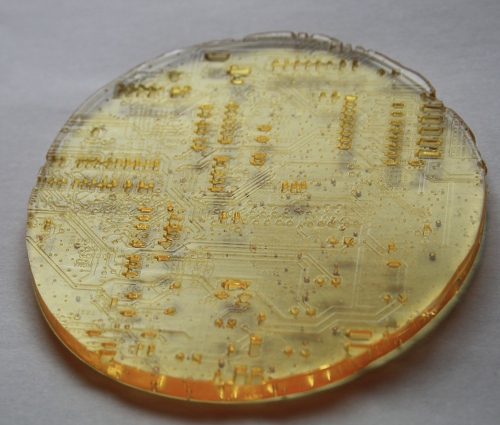 3mm polymorph pressed into back of computer card. 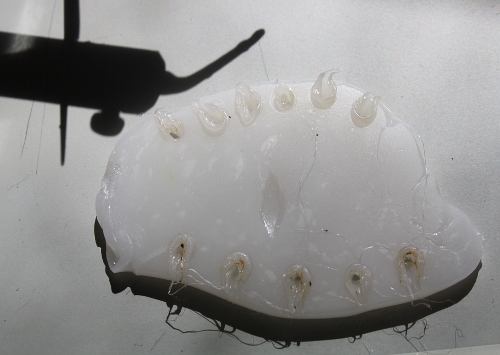 The photograph above shows the fine detail that the polymorph can hold as a molding material. The printed lines connecting components are clearly visible if the light strikes in the right direction. Marks appear in clusters, but there is still a sense of organisation and purpose. It is only in closeup that the detail is visible. 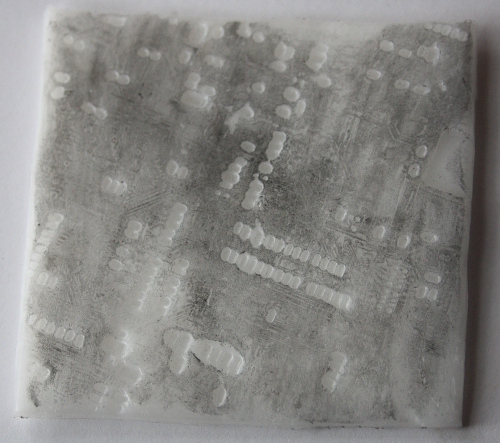 Charcoal was rubbed over the surface in an attempt to make the patterning clearer, but the effect is unattractive. The backlit view is more interesting, despite a poor quality photograph. The effect is reminiscent of a city at night – or perhaps a surveillance photograph of a car park. I think this has possibilities to be a supporting texture in a larger whole. Possibly it could be combined with actual computer parts, or with larger, more three dimensional molds. 3mm polymorph sheet, molded using wide synthetic warp-faced luggage strap and a loose round braid of synthetic yarns. Strong, parallel diagonals cross the work in a variety of textures. There is a rigid regularity on the lower left, formed by the warp-faced strap, although the edges could have been captured more clearly. The more chaotic nature of the loose braid and the areas left unmolded provide variety and interest. The charcoal effect is too messy, but it does break down the rigidity of the strap area. 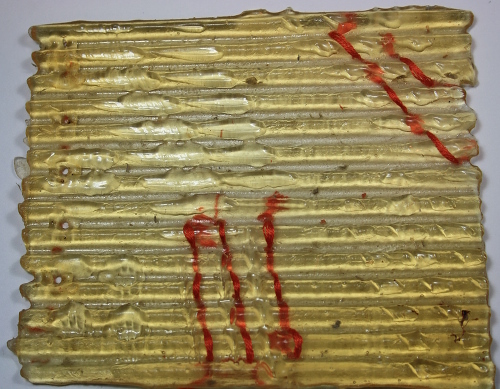 Although this sample used textiles, it was a careful choice to use smooth surface materials in this initial attempt. The character of the different textile structures has been molded into the surface, but there are no actual fibres caught in the plastic. 3mm polymorph sheet molded into weaving sample. 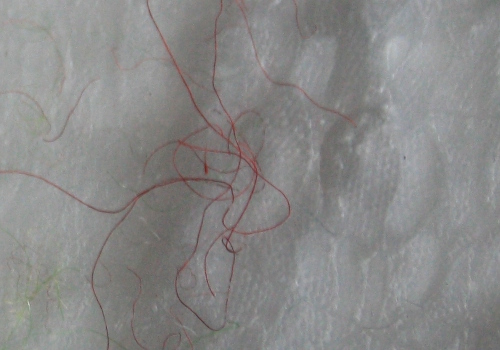 In this sample I invited the embedding of fibres from the textile source. 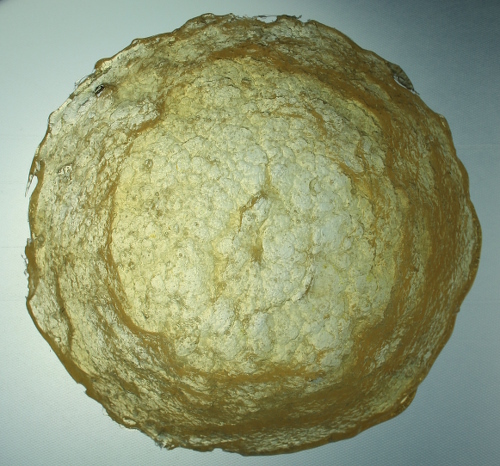 The textile was a sample originally created in project 9 of A Creative Approach (14-October-2012). The polymorph sheet was placed in an area with a variety of wefts, including torn fabric strips and woolen rug yarn. 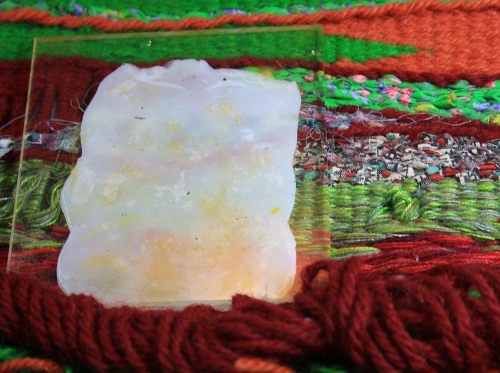 It can just be seen in the process photograph that a square of perspex was used to push the polymorph into the textile to provide a uniform pressure. It would be interesting to repeat this sample with localised pressure to take up as much texture as possible. The closeup photograph shows the fine level of detail – even the weave of the fabric strip weft can be identified. Fibres have been caught in the molding material, an effect that really attracted me in the work of Rebecca Fairley (16-August-2015). Here is doesn’t work, and in particular the scales are wrong. The fine detail of the different tapestry techniques were captured in the polymorph, but are heavily obscured by the wool fibres, which distract rather than enhance. The rhythm of work was quite different in this exercise. Melting the polymorph pellets and rolling to a reasonably uniform sheet took time and was repetitive. It seemed difficult to be spontaneous, to follow a line of thought or speculation. In some lights the results look like plain, misshapen lumps of white plastic. I spent more time and effort taking many, many photographs – those shown are the best of a large bunch, and some are only marginally useful. I chose the roughly regular square format as building blocks for a larger whole, but it seems to have homogenised the samples. I was very unhappy with the results initially, and attempted a number of sketches to try to see the samples more clearly. Oil crayon rubbing on copy paper. Black marker on cartridge paper. Sketching this helped me to appreciate the different characters of the samples. As a group they look bland, especially if the lighting is from a direction that doesn’t promote reflections. Looking closely increased my awareness of the detail and the variation. Black conte pencil on cartridge paper. The overlaid outlines show the close-but-not-quite consistency in sizing of the samples. While I like the softer edges, particularly on the more natural cabbage and mandarin samples, the level of variation is not quite right. It needs to be more or less. Possible improvements – add colour, be either more or less uniform in size, build up a theme (I think computer components could be explored), try thinner sheets (more pliable and translucent), push further into three dimensions.